When you woke up this morning you had a past. So did I. For some, that past is filled with remarkable accomplishments; work well done and talents used wisely. For others, that past is filled with unbearable pain; the kind that would drive them to do any number of distracting or destructive activities to avoid remembering. As different as these individuals are, both have a common denominator: they may think about their past too much. But one think I do: forgetting what lies behind and straining forward to what lies ahead, I press on toward the goal for the prize of the upward call of God in Christ Jesus (Phil. 3:13). The Greek word translated “goal” is the word skopos. Our English word “scope” comes from this word. It means “a mark on which you fix your eye.” It can also mean to “take aim.” The Christian’s life is to be lived purposefully—aimed at a target. 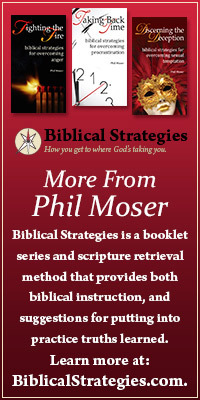 Because living the Christian life requires such focus, random living will cause us to take our eyes off the goal (Matt. 13:22). One of the ways we overcome our past is to give our undivided attention to living for Jesus today. The “prize” is best understood as our Christlikeness. Elsewhere Paul speaks of this process. Him [Jesus] we proclaim, warning everyone and teaching everyone with all wisdom, that we may present everyone mature in Christ (Co. 1:28). Paul’s “prize” was to be like Jesus. That’s the goal each of us should have as well. And I am sure of this, that he who began a good work in you will bring it to completion at the day of Jesus Christ (Phil 1:6). Our future destination should help us maintain our focus on the prize. Yesterday I experienced this truth firsthand. We are vacationing this week in the Colorado Rockies with my wife’s family at Lost Valley Ranch. A couple of hours before dinner I decided to ascend to the summit of Sheep’s Rock: one of the outcroppings of granite that surround the valley floor. The ranch rests at 7,500 feet above sea level, the summit of Sheep’s Rock is 8,800 feet: a 1,300 foot ascent. 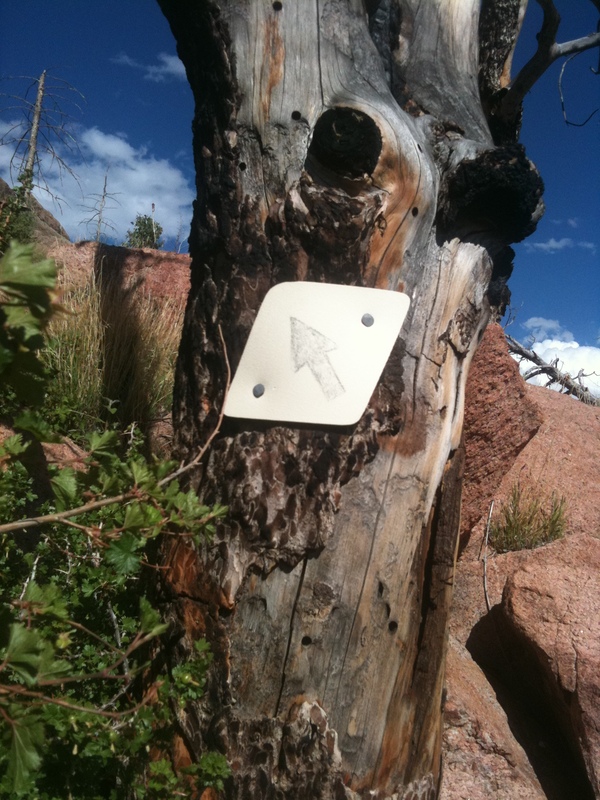 The trail is well-marked with the arrows in the picture. But as I neared the top, I was feeling the altitude or my age (not sure which one), and every time I would look for the trail marking the arrow would point up! Eventually, just looking at the arrow made me tired! I found a greater sense of accomplishment by looking back down the trail at how far I’d come. But focusing on my past didn’t move me any closer to my goal of reaching the summit. So it is with our Christian life. Battling our temptations is hard work. Living like Jesus in a world where living for self is the highest priority is not easy. But to take your eyes off the prize is a sure and certain way to not reach your goal. This entry was posted in Christian Living and tagged Lost Valley Ranch, Philippians 3:13, Sheep's Rock.